This is a site I originally made, we’ve updated once and now we’ve updated a second time. The original site was hand coded by me using PHP and Mal’s E-commerce. This time around we’ve moved the site onto a WordPress platform using custom post types and we kept Mal’s E-commerce as the checkout system. While Mal’s Ecommerce doesn’t have a WordPress plugin or shopping cart system, I was able to use the plugin Post Snippets to drop my precoded forms into the site. Mals is one of the best checkout sytems I’ve ever used. The ability to capture custom information upon checkout is a major pro of this system. Caroline provided me with a new logo and a basic layout that she was looking for and I took it and added a few elements to make this wonderful site. I was able to migrate their existing blog from Blogger so that everything now exists in one place. I love, love, love the new look we put together. The purple and green are so nice and clean and compliment each other well! Looking for custom cards, invitations or announcements? 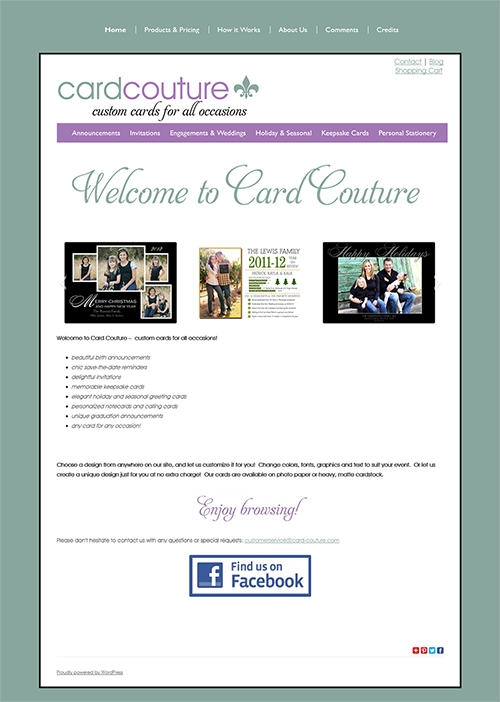 Visit the girls at Card-Couture.com!